Quick Review: It's a night like any other on board the Icarus. Then, catastrophe strikes: the massive luxury spaceliner is yanked out of hyperspace and plummets into the nearest planet. Lilac LaRoux and Tarver Merendsen survive. And they seem to be alone. Detailed Review: This book was completely new to me. The writing style, the characters, the setting- which was in hyperspace, seemed foreign to me. But strangely, I still liked it. Loved it even. I think it's the setting itself that intrigued me and also the story. The storyline seemed simple, with a rich girl who was the daughter of the owner of a spaceship falling in love with a war hero, which is basically like the high school equivalent of popular girl falling in love with a musically talented guy. BUT... Yeah I know it's alot of buts BUT this book guarantees that I must use this connective. The circumstances which the duo were cast into were very interesting. VERY, very interesting. They're stranded on a planet after crashing on it and find it to be uninhabited by anybody other than them. And the people whose whispers belong to. It starts with the whispers, then the hallucinations. At first, only Lilac hears and sees them. Then Tarver. I liked this love story because of its naturality and loved to see how the circumstances shaped their relationship. The love wasn't the typical love at first sight, but it took time to develop. And the ending was nice. It's not the type that you would cry your heart out over, but nonetheless it's still a great ending. P.S. 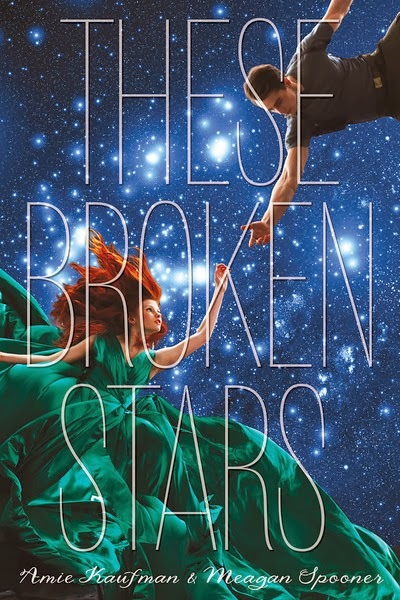 These Broken Stars are going to be made into a TV show!!! I'm so excited for it's release!!! Brief Review: I honestly think both the authors did a great job with the story and the characters. It's impossible to say how many times this book had me almost in tears. Oh THE TWISTS!!! If you're looking for science fiction with romance and mystery in it, These Broken Stars is my pick! My Rating: 4.5/5 Really Liked It!